The easy-to-use point and shoot Kodak CX4230 offers 2.0 megapixels of image resolution with 3X optical zoom lens, and is ideal for great prints up to 8" x 10". The CX4230 makes sharing pictures one-touch easy with the on-camera "share" button, which allows users to tag pictures for easy printing, e-mailing or as favorites right on the camera's LCD display. With the "share" button, print tagging is as simple as choosing the picture and selecting the number of prints required. When the cameras are placed in the Kodak EasyShare camera dock and pictures are transferred, the Kodak EasyShare software automatically launches the print screen for making prints at home or ordering prints online through service providers. E-mail tagging is also simple and powerful. Users simply tag the picture for e-mailing and select an address directly from the cameras, which store up to 32 e-mail addresses. 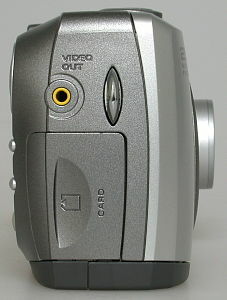 The CX4230 also has an automatic picture rotation feature that ensures that pictures always appear right side up on the camera, computer or TV. And to ensure that users will not miss the shot, the camera is always ready to snap a picture even when the camera is in review mode. It comes with 16MB of internal memory and consumers can expand their picture-taking capacity with MultiMediaCard or Secure Digital memory cards via the cameras' expansion slot. 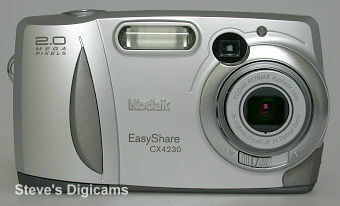 Like all Kodak EasyShare cameras, the CX4230 is designed to ensure the highest picture quality and benefit from the power of Kodak color science inside, Kodak's built-in proprietary color management technology that produces exceptional color quality under any lighting condition. 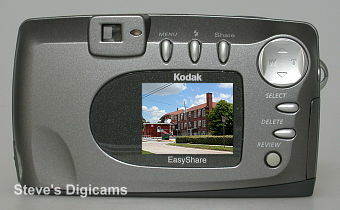 The Kodak EasyShare CX4230 is available now at a suggested retail price of $249.95. The new Kodak EasyShare camera dock II addresses two of the biggest objections to digital cameras: easy connection and battery charging. 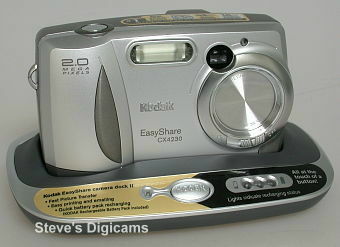 Once the camera is placed in the dock, pictures are automatically uploaded to the computer and the dock recharges the camera's battery pack. 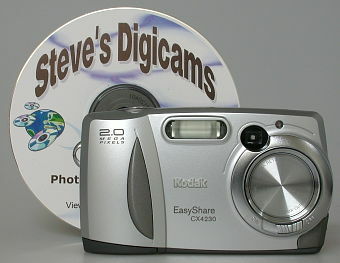 The system also includes software that allows users to connect to the Internet to e-mail or print their pictures. EasyShare makes picture sharing as easy as picture taking: one-button simple. Fast Picture Transfer: At the touch of a button, the camera dock automatically transfers the pictures into the computer within seconds, avoiding the need to fuss with connecting cables or load memory cards into reading devices. Consumers no longer face a mystery of how to get their pictures out of the digital camera. Easy Picture Sharing: The Kodak Picture Software incorporated into the EasyShare system lets you simply e-mail or print your favorite pictures. A few more clicks, and you can also edit and enhance them. Simple Picture Management: The system lets you organize your pictures automatically in folders the way you want them: by date, name or event. It also lets you automatically delete all pictures on the camera after they are transferred to a computer, readying the camera for more picture taking. 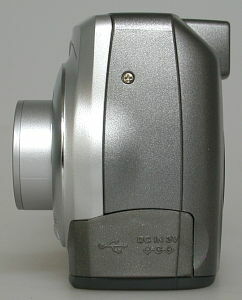 Convenient Battery Recharging: The camera is powered and recharged in the dock in less than two and a half hours, or half the time required by competing chargers. auto - 1/8 - 1/1700 sec.